It’s been ages since I’ve written about ham radio! Don’t worry, the motorcycling season will soon be over. Then it’s back to putting up those General Class training videos. On August 12th, I supported an emergency preparedness fair in Delta, Colorado, at the invitation of Eric Smith, WAØUAV. Here’s a picture he took. 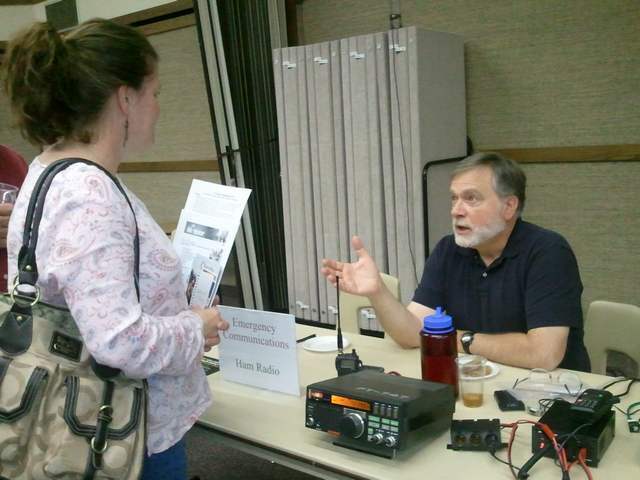 In this photo by Eric Smith, WAØUAV, I’m demonstrating ham radio at an emergency preparedness fair in Delta, CO. That’s my old Yaesu FT-747 HF rig there (one of the display lights is burned out), and right behind it is an ICOM IC-T7H dual-band (2m/70cm) handheld. The 13.8V 25A power supply to the right is a PowerWerx SS30DV. The radio laying on top of the power supply is my Wouxun KG-UV3D dual-band (2m/70cm) handheld. The fair was sponsored by the Delta Ward of the Montrose, CO, Stake of the Church of Jesus Christ of Latter-day Saints (the Mormons). The ARRL provided a bunch of handouts—many thanks to the ARRL for providing them on very short notice! This entry was posted in Ham Radio blog entries and tagged ARRL, emergency preparedness. Bookmark the permalink. Not many came to the fair. It was on a weeknight and apparently there wasn’t much prior publicity. Nice to see you at work preparing folks for emergencies. Hope thr fair went well and your education on how ham radio can help with emergency preparaness went well! Good to see you enjoying yourself gathering from your serious but helpful pose! I thought I recognized the town name of Pandora and Montrose. Back in 2010, my wife and I traveled all through the Rockies and took the train from Durango to Silverton, What scenic country you have out there Dave !!! How did the Fair do ?